PHOTO: Inside the junior king suite at the Sonesta Ocean Point Resort. With a soft opening in October 2014, Sonesta Ocean Point Resort will be the premier five-star, all-suite property in St. Maarten, bringing a new brand of style, luxury and outstanding service to this stunning Caribbean island. Ultra-luxurious yet sustainable and set in the most spectacular location, the “resort within a resort” sits on the southernmost point of the island, adjacent to the legendary and iconic Sonesta Maho Beach Resort & Casino. After a multi-million dollar renovation to the former Ocean Terrace building, the 129-room Sonesta Ocean Point emerges as a sophisticated resort option for adults combining high design and personalized service with private concierge as well as everything today’s modern traveler has come to expect. 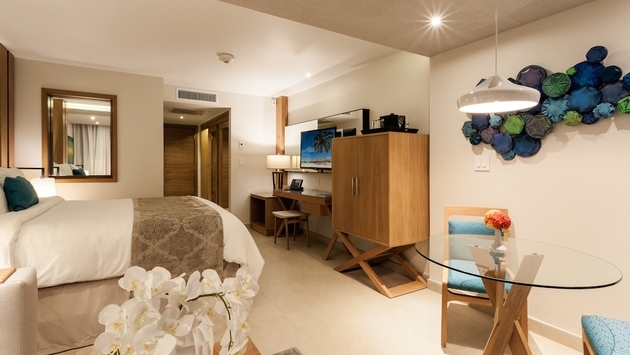 Blending contemporary design with a Caribbean vibe, the resort evokes a chic, inviting atmosphere from the public spaces to each of the spacious accommodations ranging from the 480 square-foot Junior Suite King to the lavish 2,600 square-foot Luxury Penthouse. Utilizing custom-designed furnishings, carefully laid out artwork and a modern lighting concept, the overall effect effortlessly maintains both a modern edge and the Caribbean’s laid back allure. Exclusive to Sonesta Ocean Point guests, the resort features three pools including The Edge infinity pool with private beach on the cliff, Swim Out pool connected to its namesake suites, and The Point Pool; three bars and lounges including the Sunset Lounge & Bar, Azul Rooftop Bar for private functions, and the contemporary lobby café and bar 18.63; the Mediterranean-influenced Azul restaurant; an in-resort flagship Wanderlista Boutique featuring carefully-curated resort wear and accessories from around the world; and other resort exclusivities and amenities such as 24-hour room service, intimate gazebos, private cabanas, a dedicated open air wellness area and an on property organic garden. Sonesta Ocean Point is ideally suited to accommodate weddings and other special events with a ten-acre oceanfront location, numerous venues to host weddings include the beach, a wedding gazebo overlooking the turquoise waters of the Caribbean Sea and the spectacular Azul Rooftop, exclusive to Ocean Point guests. Sonesta Ocean Point also features 24,000 square feet of renovated, eco-friendly meeting and conference facilities for business and social occasions accommodating up to 1,000 people. The new Sonesta Ocean Point Resort continues the same smart hospitality, philosophy, stellar service, and all-inclusive offerings that its sister properties, the family-friendly Sonesta Maho Beach Resort & Casino and the adults-only Sonesta Great Bay Beach Resort, Casino & Spa, have established with its loyal and satisfied clientele from all over the world. With the addition of Sonesta Ocean Point, Sonesta further expands its collection of diverse and distinctive properties as individual as its guests – offering a sense of place, not just a place to stay. The tranquil Caribbean vibe and picturesque settings are enhanced by the authentic hospitality that Sonesta brings to guests of each of its properties.